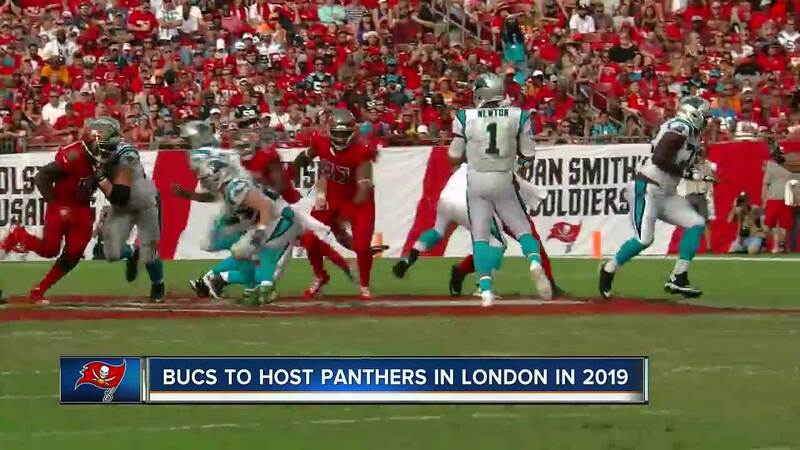 The Tampa Bay Buccaneers are headed "across the pond" for a game in 2019. The Tampa Bay Bucs are one of five teams that will host a game as part of the NFL's growing International Series next season. They will play the Carolina Panthers at Tottenham Hotspur Stadium during Week 6 on October 13, 2019 at 9:30 a.m. EST. We'll be London bound to take on the Panthers in 2019! This will be the Bucs' third trip to London. They played the Patriots at Wembley Stadium in 2009 and the Chicago Bears at Wembley Stadium in 2011. The other four teams to host International Series games in 2019 are the Jacksonville Jaguars, Los Angeles Chargers, Los Angeles Rams and Oakland Raiders. Four of the the games will be in London and the fifth is scheduled for Mexico City.